You are required to be a resident of Rhode Island for at least one year prior to filing for divorce. Rhode Island is a no-fault divorce state. In a Rhode Island no-fault divorce the spouses agree that irreconcilable differences have caused the irremediable breakdown of the marriage. You review, sign, and file the initial divorce documents with the Family Court Clerk. You then serve your spouse with the divorce documents and provides him/her with the documents he/she needs to complete and file. Both spouses and a witness (who can testify to your residency) attend the divorce hearing. After waiting the required 90 days after the divorce hearing, the judge finalizes the divorce by signing the Final Judgment. 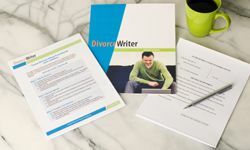 DivorceWriter provides forms specific to the state of Rhode Island and offers a money back guarantee if your documents are not accepted by the Court. You have qualified to use DivorceWriter to complete your Rhode Island divorce papers online. Select "Continue" to start the interview.